Its assembly of world class and multiple using systems, which includes 635nm class two laser diodes, makes the tool easier to use. A well-equipped controlling section maintains the accuracy for the operators. Accuracy: ±1/8 inch up to 30 feet. Self levelling: Smart pendulum leveling system. Applications: Alignment of walls, partitions, frames, fittings, leveling of fixtures, cabinets and many more. Before using a product one should have some clear ideas about what he is going to use. 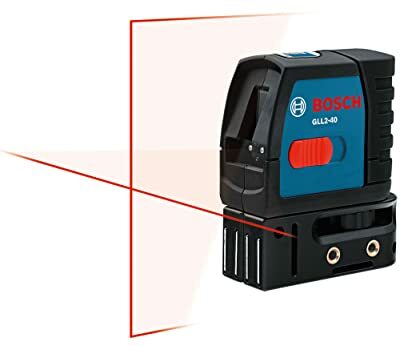 Here are the pros and cons of Bosch GLL2-40 Cross Line Laser in short. Use of standard AAA batteries, no botheration about charging the device. The laser is not visible in sunlight or in front of the bright light source. Takes a little bit of care for the best output. 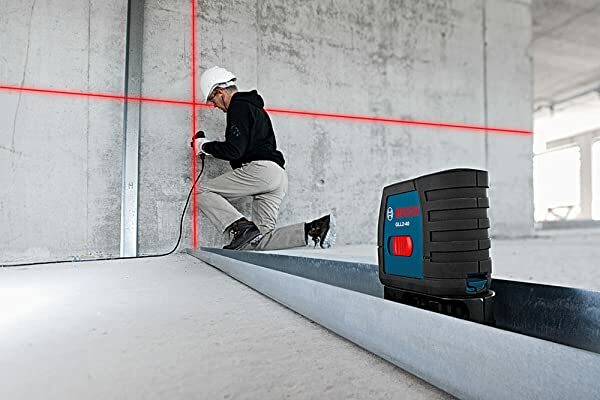 The Bosch Laser Level GLL2-40 is the standard for all other cross line laser presented in the marketplace because of its special features and extraordinary specifications. Most of the advanced technology is used for building such a machine. The cross line laser has two different 635nm laser diodes for both the horizontal and vertical use of the tool. Diodes are of Class 2 diodes as this one is bright enough and can be visible within 50 feet of distance when it is used for home or offices or other indoor purposes. It is designed to have the accuracy of ±1/8 inches at up to 30 feet. It has a smart pendulum leveling system for self-leveling. Besides magnetic wall mount system Bosch GLL2-40 can easily be mounted on a tripod. It provides 360-degree rotation and set up with convenient ¼-20 or 5/8-11 tripod mounting. 3 AAA batteries can run the tool for quite a long time. The set of batteries comes along with the product when delivered. The cross line laser measures 3.1 inches by 1.6 inches by 3.8 inches in dimensions. It’s simple and small. Easy to carry. It gives the 30-day money back guarantee if the product is found disable and 2 years warranty. The cross line laser compiled with some classic technologies for upcoming world is favorite to all for its user-friendly features. This device is helpful for the construction related any person who wants to perform his or her job so smoothly and finish that as picture perfect. For immensely accurate interior, and doing it within a short time, the Bosch GLL2-40 is the best support for the craftsmen. Dependable horizontal and vertical laser also help in installing or paneling or wainscoting. Not only constructors, this electronic tool is used by carpenters, electronic workers and plumbers too. This tool is one of the smallest laser tools that can be carried anywhere without any trouble. It has such an architecture so that it can be carried in pockets. The most effective specification that this tool has its two laser beams, one horizontal and one vertical. While installing the floor, or adjusting tiles the lasers measure at its best and gives the best outcome one can ever have. As it has a risk free and easy mounting system, it is the easiest to handle as well as to install. It can rotate 360 degrees. It has also integrated floor and magnetic wall bracket. As a result, the user needs not to bother about hanging or installing the instrument to some place. If you are looking for a perfectly straight ceiling, or a door installed in front of your house or even painting stripes on wall, Bosch Laser GLL2-40 is your helping hand. You just draw everything and measure the distance between, rests will be done by the self-leveling cross line laser machine. This product comes as a package. As it runs on battery, the device can be used right after its arrival. This is always good to read the user manual before using any electronic device. Though it will not harm anyone badly, still I will suggest having a look at the user manual to know the every single thing about using and maintenance of the tool. This electronic device serves you the best when you use it in an optimum condition. The laser has two laser beams that come from two different diodes. So it needs a little bit of care as the lasers can be damaged if it is used carelessly. The batteries are the power supply of the laser. So an individual should check for the batteries regularly for the best performance from it. If there is any problem found, one should immediately inform the company. The company is always obliged to serve you the best. If you are looking for something that will carry away your tension about the flawless finish of your construction body, GLL2-40 laser will take all your tension away and give you proper happiness. 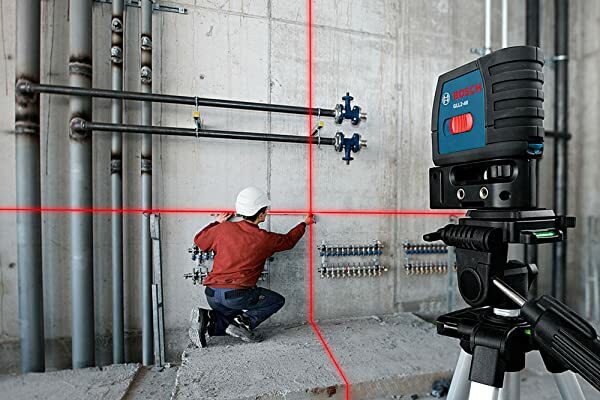 It is the best compact laser level for any kind of indoor works. Ask any professionals if you have any more queries about the tool. And after that, do not hesitate to get yourself one to make your job easier. Read our latest laser level reviews for more products.